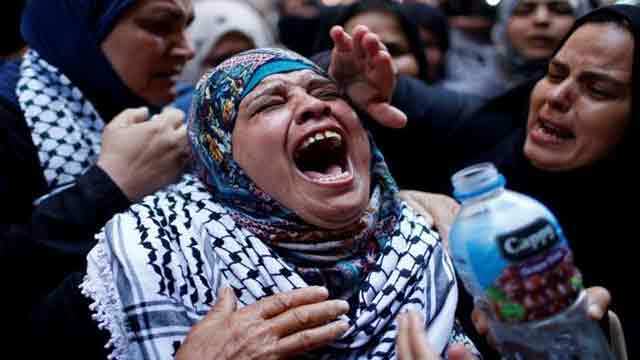 Gaza, Jun 3 (Just News): Too worn out to shed more tears, Sabreen al-Najjar recalls the last time she saw her daughter alive. "She stood up and smiled at me, saying she was heading out to the protest," the 43-year-old told Al Jazeera from her home in Khuza'a, southern Gaza Strip. That protest was the 10th Friday demonstration held by Palestinians since March 30 near the fence with Israel dubbed the Great March of Return. Sabreen's daughter, 21-year-old Razan, had been in all of them, volunteering as a paramedic to help those shot by Israeli snipers. "In a blink of an eye, she was out of door. I ran to the balcony to watch her outside but she had already made her way to the end of the street," Sabreen said on Saturday, surrounded by grieving relatives, friends and female patients her daughter had once treated. "She flew like a bird in front of me." At the protest site in Khuza'a, witnesses said that Razan approached the fence on Friday in her medic's vest and with both of her arms raised to show the Israeli soldiers a 100 yards away that she posed no threat. Her intention was to evacuate a wounded protester lying on the other side of the fence, after he had managed to cut a hole through it. Instead, Razan was shot in her chest with live ammunition, the single bullet escaping through a hole in the back of her vest. She became the 119th Palestinian to be killed by Israeli forces since the popular protests began calling for the Palestinians' right of return to the homes from which they were expelled from in 1948. More than 13,000 others have been wounded. Rida Najjar, also a medical volunteer, said she was standing next to Razan when she was shot. "As we entered the fence to retrieve the protesters, the Israelis shot tear gas at us," the 29-year-old, who is not related to Razan, told Al Jazeera on Saturday. "Then a sniper fired a single shot, which hit Razan directly. The fragments of the bullet wounded three other members of our team. "Razan at first didn’t realise she had been shot, but then she started crying out, 'My back, my back!' and then she fell on the ground. "It was very clear from our uniforms, our vests and medical bags, who we are," she added. "There were no other protesters around, it was just us." In an interview with Al Jazeera on April 20, Razan said that she felt it was her "duty and responsibility" to be present at the protests and help the wounded. "The Israeli army does intend to shoot as many as they can," she said at the time. "It's crazy and I'd be ashamed if I was not there for my people." Speaking to The New York Times last month, Razan described the enthusiasm she had for the work she did. Razan also dismissed societal judgement towards women working in the field, where she herself would put in 13-hour shifts, beginning from 7am until 8pm. Sabreen said her daughter had been on the front lines tending to injured protesters since March 30 - and not just on Fridays. She became a familiar face at the Khan Younis encampment, one of five set up along the length of the fence east of the Gaza Strip. "She never cared about what people said," Sabreen said. "She concentrated on her work in the field as a volunteer medic, which reflected her strength and her determination." "My daughter had no weapons; she was a medic," she added. "She gave a lot to her people." Medics on the ground previously told Al Jazeera that Israeli forces have been shooting at demonstrators with a new type of round. Known as the "butterfly bullet", it explodes upon impact, pulverising tissue, arteries and bone, while causing severe internal injuries. "She was deliberately and directly killed by an explosive bullet, which is illegal under international law," Sabreen said. "I demand a UN investigation so that the murderer will be tried and convicted," she said, describing the Israeli soldiers as "brutal and unforgiving". When Sabreen spoke again, her words elicited wails from the women around her. "I wish I could have seen her in her white wedding dress, not her shroud," she said. The Palestinian Ministry of Health said in a statement that Israeli forces targeted a group of unarmed people east of Khuza'a on Friday, which resulted in "a team of paramedics wearing white medical coats attempting to evacuate the injured". "The team of paramedics raised their hands, stressing that they did not pose any danger to the occupiers' heavily armed forces," the health ministry said. "Immediately, the Israeli occupation forces fired live bullets, hitting Razan Najjar in the chest, and injuring several other paramedics." Mohammed al-Hissi, director of Red Crescent emergency medical team, told Al Jazeera that they tried to treat Razan immediately after she was shot before she was transferred to the European Hospital in Khan Younis. "The targeting of Razan is not the first violation in our line of work as medics in the field, and it probably won't be the last," he said. "This is a war crime against health workers and a violation of the Fourth Geneva Convention which gives medics the right to offer their assistance in times of war and peace." The spokesperson of the ministry, Ashraf al-Qidra, added that more than 100 protesters were wounded on Friday, including 40 with live ammunition. The others suffered from tear-gas related injuries.